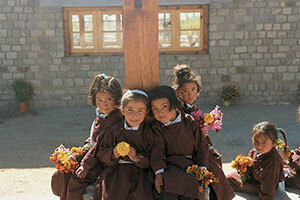 The Trust actively supports the 'Druk White Lotus School' in Ladakh, Indian Himalayas. This landmark project, under the patronage of H.H. the 14th Dalai Lama, offers a modern education combined with a deep respect for the Himalayan environment and traditional culture. It will help thousands of children to achieve a better life. Each year the Trust donates a percentage of any profits to this worthy cause. The photo above is of H.H. 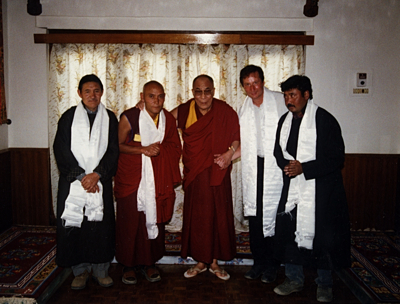 the Dalai Lama, the Charity Patron, with Michael Kern (CTET founder) and members of the project organising committee. The people of the remote Himalayan kingdom of Ladakh want to educate their children to adapt to change and to earn a sustainable living, but without losing their cultural heritage. 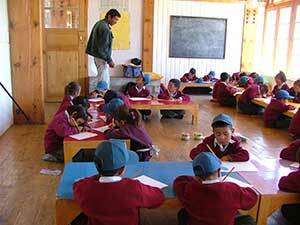 Many Ladakhis realise that education is the key to creating a viable future. The Druk White Lotus School is a local initiative that is being built in phases over a 14-year period, with a target completion date of 2014. When finished, it will provide an education for 800 children, and offer residential facilities for orphans and children from remote areas who currently receive little or no education. The Nursery and Infant School opened its doors to the first girls and boys in September 2001, the Junior School opened in 2004 and the Middle School in 2007. Currently, over 650 children attend the school. Best Green Building in the World (joint-winner).